The GPSMAP 541s is a compact chartplotter that features an ultra-bright 5" (12.7 cm) QVGA color display along with an improved high-speed digital design for increased map drawing and panning speeds. It’s ready to go with an easy-to-use interface and a built-in, satellite-enhanced basemap preloaded with all U.S. coastal areas, including Alaska and Hawaii as well as detailed charts for the Bahamas. The GPSMAP 541s also accepts BlueChart® g2 Vision® cards (sold separately) for added features and functionality such as high-resolution satellite imagery, 3-D views and Auto Guidance technology. The GPSMAP 541s comes ready to go with preloaded U.S. coastal area map data. For areas outside the U.S., the GPSMAP 541s has a worldwide basemap with satellite images in place of more traditional maps. The GPSMAP 541s also comes standard with a high-sensitivity GPS receiver for superior satellite tracking and quicker acquisition times. 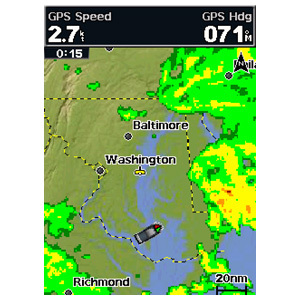 In addition, the GPSMAP 541s can receive U.S. graphical weather data via optional GXM™ 51 satellite receiver/antenna (sold separately). And with an SD™ card slot, it’s easy to add additional maps without connecting to a computer. 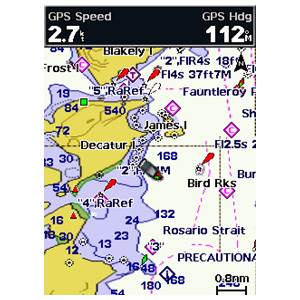 The GPSMAP 541s comes with a powerful dual-frequency transducer that clearly illustrates depth contours, fish targets and structures whether you’re fishing in freshwater or off the coast. The GPSMAP 541s also is NMEA 2000®-certified for easy connectivity with sensors, instruments and future marine offerings. *Sounder available with and without dual-frequency transducer. See versions tab for details.